Be sure to register for GA by this Friday. Rates increase on Saturday, May1. 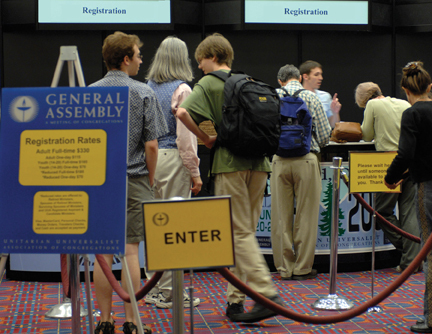 GA registrants receive access to all workshops, performances, lectures, and events listed in the GA Printed Program, as well as an official name badge to identify them to fellow participants, event staff and security. GA name badges are required for admission to all GA programmed events, including evening entertainment, the Exhibit Hall, the Opening and Closing Celebrations, and the Ware Lecture. Folks waiting in line to register on site for General Assembly. Register prior to GA to avoid the wait. Register by April 30 for the lowest registration rates.